Finally, after being a Helix fan for decades, I got the opportunity to have a quick chat with guitar stalwart Brent “The Doctor” Doerner as he finished playing his second last show with the once dubbed “hardest working band in Canada”. When asked why he was once again leaving the Helix fold, he responded by citing the fatigue of touring and susceptibility to illness always being in and out of airports among other things. Brent also mentioned that he had planned to concentrate on his video production company Red D Films. “Have you ever heard of the band Killer Bee?”, he asked me, stating that he was working with them right now and that it would be in my best interest to look them up. I took his advice and looked into Killer Bee. Thank you, Brent, I owe you on this one! This hive of Killer Bees first buzzed to life in 1990 with Swedish bassist Anders LA Ronnblom collaborating with Canadian vocalist Brian Bee Frank. The band gained some notoriety in Europe playing many major festivals, Red Square Moscow, attaining a #1 single with “Take Me Home” in Norway and issuing three solid rock albums. The first album was Raw in 1993, Cracked Up in 1995 and World Order Revolution in 1997. Alas, as we’ve seen too many times before in the industry, the behind the scenes management bickering and other business caused them to take a break. The hiatus would last 15 years before the songwriting team and original members Ronnblom and Frank would rejoin and put out Almost There, a compilation of songs from their earlier work that they felt best represented the band. The demand for Killer Bee was high and this prompted them to reconnect with Canuck drummer Morgan Evans. 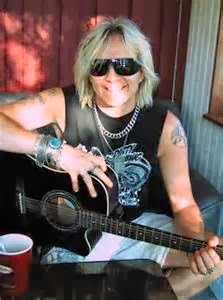 Evans was originally inducted into the colony in 1995 and has also played with Lee Aaron and in HardRoad, a band featuring Russ DWaRf. Jimmy DeLisi took on guitar duties while Canadian Denny DeMarchi (former member of Cranberries and Alias) handled keyboards and rhythm guitars. This new line up thrust forth From Hell And Back in 2012 to positive reception from critics and fans alike. music and contains something for everyone. The cover art of Evolutionary Children evokes immediate thoughts of creepy killer clowns, but there’s nothing scary about this record. “Children of the Evolution” begins the album in a slow moving, but epic Black Sabbath-esque pace that certainly grows on you with each listen. The album changes pace a few times throughout the listen with the bluesy power ballad style of “All The Things You Say”, the Beatles-sounding pop flavour of “Got Your Number”, the emotion-laden piano beginnings of “Angel’s Dust” and the perhaps morbid thoughts of “If We Die Tomorrow”. The 70’s classic rock/boogie feel of “Gimme A Taste” adds yet another style into the mix. But it is the kick you in the face attitude of rockers such as “A Little Too Old”, “Letz Dance” (yes, it’s spelled that way on the CD inlay), “Ride On”, “I’m On Fire” and “Scream It” that really drive the record for me. Vocalist Brian Bee Frank delivers the lyrics with emotion and feeling on all cuts and his voice shines through. All in all, everything comes off really well here and is another fine offering from the Swedish/Canadian outfit. This album keeps you interested until the end, unlike so many others that just start to blend together in the middle. The well-constructed songs are more complex than on a first listen, with something new being heard on every spin. Killer Bee are back and that’s awesome, just ask Ron Jeremy! Recently founder, songwriter and bassist Anders Ronnblom took the time to call me from Sweden and talk about all things Killer Bee. Meister: Anders, thanks for taking the time to chat with me today, or I guess it’s after midnight for you so I won’t keep you too late. Anders: No problem Rich I’m here for you so ask anything you want to know or talk about. Meister: Well, let’s start with the band. It’s made up of half Canadians and half Swedish members? Anders: Well, Swedish is the minority now. Brian lives in Sweden, but he’s Canadian and so is Morgan and Denny and Jimmy is from Florida, but we were more Swedish-based in the 90’s. Meister: After a fifteen-year absence you released Almost There in 2011? Anders: Yes, Brian and I released Almost There as we wanted closure on Killer Bee. All the changes in the musical landscape since 1998 with everything being physical records and print magazines, we wanted to get it out digitally to keep the music alive basically. From there I was contacted by various webzines saying, to my surprise, how great it was that Killer Bee was back. On a visit to Toronto to see Morgan Evans in November 2011, he introduced me to Denny DeMarchi and we recorded some of the songs that were in my head at the time and From Hell and Back was born. Meister: And now you’ve partnered up with adult film star Ron Jeremy? Anders: I was working as a bartender and was watching all these bands coming with the beers and the wines etc. Back in ’95 we actually made a beer called Killer Beer, but it was ahead of the times I guess. The representative for Ron de Jeremy Rum (the star’s own brand of rum) met me there and we stayed in touch. Ron really liked the Killer Bee music and we wanted to do something together, so that’s how that came about. Meister: So what’s different this time around with Killer Bee? Meister: I’ve only seen positive reviews so far for the record. Anders: Yeah, very positive so far but the people that say it’s too spread out don’t get what we’re doing with our melodies is because they don’t give it enough time. A band that did it totally upside down was Queen, they did “Bohemian Rhapsody”, they did “Tie Your Mother Down”, “Another One Bites the Dust”, “Crazy Little Thing Called Love”, “I Want to Break Free”, “Flash”, so many….I’m very happy with everything we’ve done and it’s always been important with the Killer Bee songs in general is to have a groove in the song that your feet start moving when you hear the song because you need to have that rhythm. Meister: What about the cover art, what’s the inspiration there? It looks to me like a killer clown. Anders: You are exactly right, Rich. The clown thing, with the Killer Bee symbol in the eyes that I designed myself, we started with a clown on the From Hell and Back album. It’s a thing we all do, having that clown face on us, never showing exactly what we feel, boys should not cry, you know, don’t show any weakness etc, etc. Hiding behind masks as people is the general idea and the clown thing will follow us for a while. Meister: I think everyone hides behind a mask to some degree. I’m hoping that there will be a tour of some kind, I’d love to see Killer Bee live. Maybe when I come over for Sweden Rock this year? I heard that there is a campaign to get you playing at the festival. Anders: Shows are hard to play, well with three of the guys in North America (Brian, although Canadian lives in Sweden) and two in Sweden, how are we supposed to play, but we’ll see what happens. One reviewer asked me why we were putting out so many videos as there’s no MTV anymore. 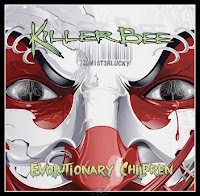 So the videos show that we actually are a band and for marketing to show that Killer Bee was back. Anders: When people ask why are you putting out a new album so fast….same thing with the albums as the videos, in the 90’s when you had an article in a paper magazine you could actually survive on that article for 6 months. Nowadays it’s like a machine gun on the internet, you basically have to be on every page to be noticed, it changes so fast. I said to Brian and the guys, it’s gonna be like an avalanche, we got this in motion now so we just have to keep going like a runaway train. The idea of the clown will follow us to the next album too. It’s already written even! Meister: Wow, Evolutionary Children is just out and you’ve already got another one in the works, it is an avalanche! Before Killer Bee, the band was called something else and released one album? Anders: Yeah, Desert Rain. 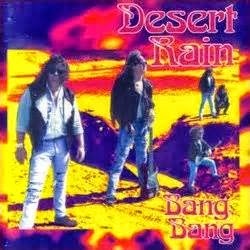 There are bands named this now, but this was in the beginning of the 90’s when they invaded Kuwait and Iraq started to blow up all these oil wells and they said on the news that it’s raining oil in the desert, so you have desert rain. After playing in Moscow in The Red Square a festival there at Olympic stadium, we broke with the Swedish label. Being very stubborn we walk our own way because if the shoe doesn’t fit we walk away. We went down to Canary Islands and Crete and just played as a cover band for awhile enjoying ourselves and then renamed from there. On Almost There is three Desert Rain songs and the whole Cracked Up album is actually Desert Rain‘s second album and half of Raw is Desert Rain. We already had it recorded so just a name change and the music became a bit harder. On World Order Revolution we had Kee Marcello from Europe play on that album and after that we just put everything aside. Meister: Thanks for talking to me tonight and hopefully we can get you some exposure over here in US and Canada. Anders: Yeah, that would be great, the guys deserve to get some recognition back home in Canada as well.